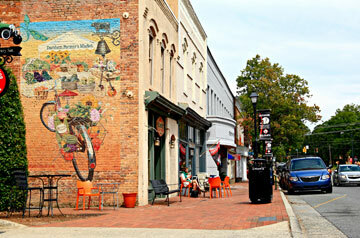 The town of Davidson is located just 20 miles north of Charlotte and roughly 1 mile east of Lake Norman. If you exit 77 north via exit 30, to the left you will see Davidson’s island of lakefront condo’s or to the right you will experience a real life Norman Rowell/Mayberry scene. Davidson is centered on its history and the college that is the pillar of the community. On the southwest edge of the college campus is Main Street Davidson where the town is always lively with the students that this renowned college bring. The main mode of transportation in this town is foot and bike. The town is full of active people who run, walk and bike the area’s rolling terrain. Saturday morning’s are a treat in Davidson when the farmers market opens for business. It is a quaint attraction that brings folks from all over Charlotte. While Davidson is a college town, the college is small and the students fit in like they are from the families that originally settled the area. The town locals and students come together around Main Street and the college campus to celebrate and be with each other every day.